Product prices and availability are accurate as of 2019-04-11 02:18:12 EDT and are subject to change. Any price and availability information displayed on http://www.amazon.com/ at the time of purchase will apply to the purchase of this product. 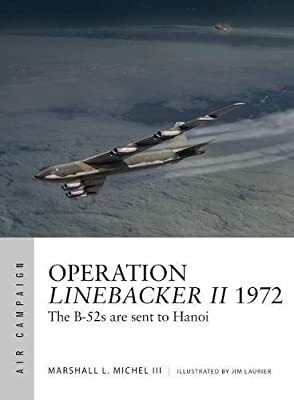 In an attempt to end the war quickly and "persuade" the North Vietnamese to return to the negotiating table, President Nixon ordered the Air Force to send the US' ultimate conventional weapon, the B-52 bomber, against their capital, Hanoi. Bristling with the latest Soviet air defense missiles, it was the most heavily defended target in Vietnam. Taking place in late December, this campaign was soon dubbed the "Christmas Bombings." Using specially commissioned artwork and maps, ex-USAF fighter colonel Marshall Michel describes Linebacker II, the climax of the air war over Vietnam, and history's only example of how America's best Cold War bombers performed against contemporary Soviet air defenses.